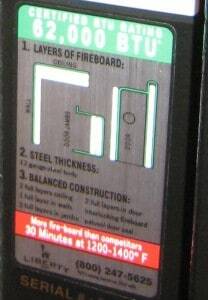 Home » 11 Myths about Gun Safe Theft Protection » Gun Safe Fire Label Closeup Showing Construction. Gun Safe Fire Label Closeup Showing Construction. Gun Safe Fire Label Closeup Showing Composite Door Construction.